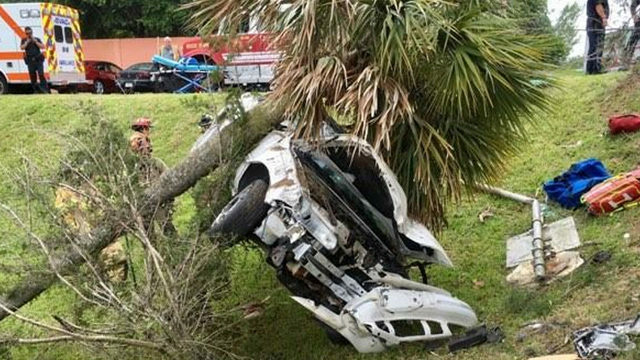 MELBOURNE, Fla. - There are all kinds of hazards on the roads, but drivers in Melbourne are having to deal with something a little different. For the past few days, a protective pair of Sandhill cranes have been defending their nest. The birds have been pecking at cars and standing in the middle of the intersection at NASA Boulevard and Evans Road near the Melbourne Airport. "He's pecking at cars, pecking at tires, it's pecking at windshields. It's basically playing with traffic," said Brock Williams. Local 6 watched as a male Sandhill crane dodged in and out of traffic -- prompting drivers to repeatedly honk their horns. Some drivers got so frustrated they jumped out of their cars and shooed the bird away, but only for it to return again. Drivers say the mother, who was watching over her two eggs Friday afternoon, usually participates, but she let the male do all the pecking this time around. "He's beautiful, but I can hear him pecking at my car and he's damaging my paint as we speak," said Williams. James Dean, a local wildlife trapper, says he's received dozens of calls from folks who want the cranes moved away from the street, but because they're federally protected he can't touch them. So, Dean did the next best thing and built a barrier to protect both the birds and the cars. "If there's a car that's right near the nest with the traffic being backed up at the light, once she gets back to the rope, she doesn't fly over it or go under it, she backs away and goes back to her nest," said Dean. Florida Fish and Wildlife Commission doesn't know how long ago the mother Sandhill crane laid her eggs, but they said it takes more than a month for the eggs to hatch. As long as the birds are near the intersection, FWC wants drivers to use caution.